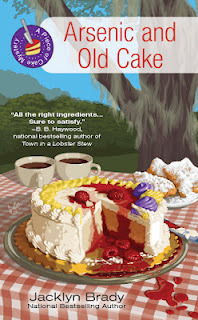 Arsenic and Old Cake by Jacklyn Brady is the 3rd book of the Piece of Cake cozy mystery series set in contemporary New Orleans. Rita Lucero owns Zydeco Cakes, a high-end bakery. She's constantly short on time, failing to meet all her commitments; the only facet of her personality to which I can relate. The bakery is in trouble financially, short on orders; one employee wants her to cut staff, another wants her to change their target clientele. Rita's mother-in-law, co-owner of the business, does not want to drop her son's original dream for the bakery; it must continue catering to the elite. Rita is distracted from running her business by a request from a friend: blind trumpet player Old Dog Leg wants her to pretend to be on her honeymoon, in a motel over the weekend, with bartender Gabriel Broussard. Why? Dog Leg's brother Monroe has been missing for 40 years, now wants to see him; Monroe is staying at the honeymoon motel. Dog Leg cannot see for himself if the man is really his brother; he wants Rita to check for a birthmark on the man's shoulder. Rita's mother-in-law is seriously upset at Rita spending the weekend in a charade with the bartender (can you tell, Claire is an elitist snob?). This plot premise is actually quite ridiculous. Dog Leg could simply invite his 'seeing' friends Rita and Gabriel to meet with Dog Leg and Monroe, then ask them to check Monroe's shoulder, while Dog Leg asks Monroe questions to see if he really is his brother. But Rita goes for the charade. She's tempted many times by Gabriel's sexiness, but resists him for the sake of her independence, an over-the-top reaction to formerly working as a menial in Albuquerque. She senses there are secrets among the elderly residents, related to their blatant hostility toward Monroe. When a motel resident is murdered, Monroe leaves, and Rita's sure all events and secrets are related. She's right, but it takes a lot of interviews for her to get the facts from decades ago. And of course she finds herself in mortal danger. Sign into Goodreads to see if any of your friends have read Arsenic and Old Cake.